Born in Groton, MA, and a 2007 graduate of Groton/Dunstable Regional High School, Sergeant William Woitowicz enlisted in the Marine Corps in September 2007. 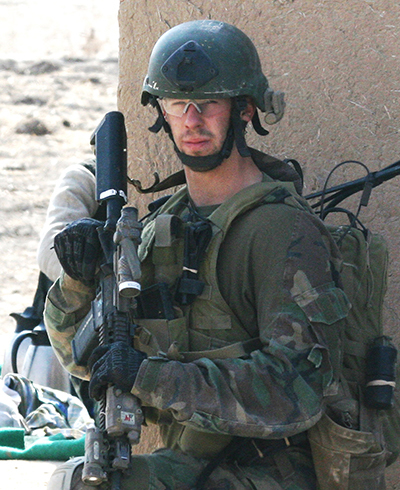 He began his career as an Aviation Logistics Tactical Information Systems Specialist and joined MARSOC in 2009. After completing the Assessment and Selection Course and Individual Training Course, he became a Critical Skills Operator in 2010. Sgt. Woitowicz was a basketball player in high school and earned a brown belt in the Marine Corps Martial Arts Program. While with Fox Company, MSOT 8221, Sgt. Woitowicz served as a combat advisor for the Afghan Local Police. Shortly after a heliborne insert, the MSOT and Afghan Commandos came under intense enemy fire. Sgt. Woitowicz exposed himself to direct enemy fire to enable the team to withdraw to a rock wall for protection, and while scaling the wall after saving his teammates, he was mortally wounded. Sgt. Woitowicz’s personal decorations include a Silver Star awarded posthumously in April 2012, a Purple Heart, Combat Action Ribbon, and Good Conduct Medal. He was promoted to Sergeant posthumously.